Please read before purchasing your order(s). 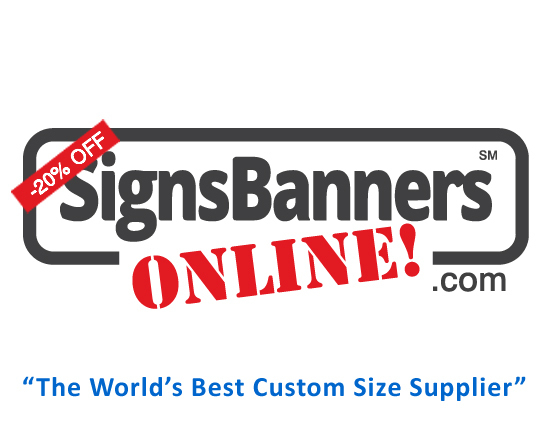 signsbannersonline does not hold or inventory 'stock banners' or shelf products. WE custom make your orders to suit your advertising designs within various manufacturing capabilities and techniques to produce individual print runs. Customers can upload artistic designs & SIZES exclusive to them. This is called 'CUSTOM'. Purchasing Custom Products from SignsBannersOnline requires customers understanding of the following. This ensures fair dealing and understanding so that the customer receives discount prices and certain free items applied. NOTE: NO REFUNDS, EXCHANGES OR RETURNS ARE ACCEPTED ON ANY CUSTOM ORDER. NOTE: ALL ORDERS ARE DETERMINED AS 'CUSTOM'. Custom orders are non refundable, non returnable nor exchangeable. Instantly as an order is processed, it is scheduled for production and printing/manufacturing steps begin. Purchasing Preset Sizes Preset size banners, posters or flags or other shop products are printed with your designs and are thus custom. The preset size options available at the shop are not pre-printed and are 'made as needed', and can not be returned. They are determined as 'CUSTOM' and will be printed/supplied with your designs, labels or markings. Preset size orders are non refundable, non returnable nor exchangeable. Instantly as an order is processed, it is scheduled for production and printing/manufacturing steps begin. DIGITAL SIGNATURE APPROVE ONLINE Before any order is accepted, SignsBannersOnline requires customers to acknowledge readership of this page and acknowledge the Terms & Conditions herein. This digital signature is also associated with all order progress tracking you can use to follow the various steps / stages of producing your banner sign. Wherein an SBO staff member onbehalf of the customer digitally signs the order via customer verbal or written or payment as acceptance then the customer accepts all terms and conditions. Payments for acceptance are allowed via any payment system - online or offline. PAYMENTS VIA PAYPAL ONLY We only use the PAYPAL gateway for online orders. Applies Worldwide. Also see How PayPal calculates your local Currency. RETURNS NO RETURNS ARE ACCEPTED The work we provide is custom and not returnable. We do not have any return options. Goods and/or orders are not accepted for return in any circumstance. It is the customer sole responsibility to proceed ONCE proofs are accepted by the customers and/or the sole responsibility to ensure delivery details are correct and goods deliver-ability is suited. NO RETURNS ARE ACCEPTED. NO REFUNDS ARE ACCEPTED. Read more below. Promotional Offers FREE SHIPPING. Occasionally Free Shipping may be applied to orders and such promotional offer may expire. FREE EYELETS/Grommets RINGS Promotional Item IF applicable. Occasionally, Free Eyelets/Grommets are offered to customers. Determined every 12 inches, 20 inches, 40 inches or other may be advertised and promoted. Eyelets/Grommets are not standard. ANY PROMOTIONAL OFFER may expire. Promotional offers are at time of order only. FREE DELIVERY WE DELIVER FREE WORLDWIDE Our large production and delivery turnaround allows us to deliver your orders free* as a limited time offer. 1. Free delivery is based on a maximum value per item as calculated CBM or Weight/kg (international KG standard) [shown as US pounds (LB)] which ever is the greater as determined by carrier and is shown to be valid or invalid at time of quoting price via the price calculator. Free shipping may be a promotional item not available on all products or promotions or areas of service. 2. Free delivery is based on standard ground freight with NO promise of time line. 3. Free delivery is based on standard national/state/territory taxes. 4. Free delivery is based on standard global distribution points from single carrier. 5. Free delivery is based on single delivery FIRST TIME attempt by carrier. Redelivery is a FEE charged to a customer. You are expected to monitor and manage your shipping via your special 'MyPage'. We do not assist with shipping management and the shipping mgt has been removed from our business plan. This is a Do-It-Yourself Wholesale Order. Nb. The customer pays for any additional fees or charges or redelivery if: Not at address at time of delivery, if: additional charges are charged to SignsBannersOnline at any stage(s), if: taxes and local charges are applied by local authorities, if: any other fees are incured. 6. Redelivery is payment responsibility of customer regardless of reasons. We are not the carrier, and pass all costs to you. A statement fee may also be applied. 7. Free delivery is based on customer Self Management via their MyPage. 8. Free delivery is based on a capped monetary value range shown at Calculator at time of order. 9. Free delivery may not be available in your region or delivery destination. FREE SHIPPING APPLIES Free Shipping Applies (FSA) may be promoted as a special offer from time to time and this may expire if an advertising campaign expires, an alteration in shipping company policy and/or charges or changes or other circumstance wherein the free shipping campaign is extinguished. We will honour any paid processed order with FSA (free shipping applies) only. If FSA is no longer available for a time period or end of campaign SignsBannersOnline is not under obligation to reinstate FSA. FSA Free Shipping Applies to combined line items shown at bottom of Calculator at the time of the promotion validity. FREE SHIPPING VALUE Free Shipping may limit to a monetary value as set within the advertised advertising campaign. This will be set inside the price calculator and may change from period to period, locality to locality. Check latest promotions available at the Price Calculator/Cart page. SOME SHIPPING PAYMENT REQUIRED If an order is less than or exceeds the promoted Free Shipping Value, a client may be required to pay a balance or full value. This 'Some Shipping Required' value is aside the free component. This means, the 'free' value has been deducted leaving a balance of 'some shipping'. Calculator Shows 'Some Shipping Payment Required' or a 'value'. If your (product total) orders are under USD $160.00 value, some partial shipping cost may be required. This is shown at Calculator. If your orders are over USD $750.00 value, some partial shipping cost may be required. Your order indicates heavier than standard packaging or shipping excess allowance(s) and may require more or larger cartons, pallets, crates or loaders or or higher payment to shipping company or other costs to effectively ship to you. This is shown as a value figure at Calculator. Any FSA is deducted showing you any balance due. SHIPPING INSURANCE NONE AVAILABLE SignsBannersOnline does not offer insured shipping. NOTE: SignsBannersOnline is automated. Refer to you PROGRESS stages for all tracking by you as the customer. 5. Our preferred shipping companies generally ETA is 3-7 days depending on your location and suitability to a destination hub. Please refer to their website for more general and localized information. We understand that your order may be deadline driven and we appreciate this element of our industry, however, shipping times are not guaranteed nor promised. Please allow sufficient time to ship out to your destination. Inadequate scheduling or delays are not reason for dispute. NOTE: SignsBannersOnline are not carriers. All delivery is contract delivery via Consignment which you have undertaken when your order and by their relevant guidelines and policies. Carriers may change from advertised to suit: a) price, b) location, c) level of service. Please track your parcels and ready any relevant carrier information via website provided. SHIPPING DELIVERY Products are shipped door to door globally using carriers/ couriers and shipping / transporting companies and agents. In general, we include packaging and handling costs within a charged shipping price but this may vary due to reasons beyond our control such as distances, cost increases, fuel levies, package sizes, cubic or dimensional weight calculations, split palleting etc. Any additional shipping / transporting costs incurred at the time of delivery or later by us at any time are payable by the client. In cases, wherein we are later charged more than transport company quoted transport prices or excess fees etc, levies, redirection costs, cubic or dimensional weight calculations or any other, these costs are passed onto and are immediately due and payable by the client. If a delivery is delayed or withheld by a client, not deliverable or mis-addressed, redirected or stopped any additional payment required to complete delivery of goods is payable by client. SignsBannersOnline use international freight forwarders, carriers, express couriers, ground couriers and other standard methods of shipping your product to you door to door (excluding private address) internationally. We have two (2) deliveries every day and upon ordering, you will receive a personal page wherein you may track various production stages of your order including DELIVERY ETA, DELIVERY COMPANY & DELIVERY CONSIGNMENT for tracking your product delivery movement and location. You can access all sectors of your shipping and as such we do not offer any support to track on-line the location hub of your delivery. RE-DELIVERY FEES IF a shipping company or agent charges SBO for any additional, re-delivery fee or other charge, this is payable by you including a statement fee and any further cost recover expenses borne by SBO. SHIPPING ADDRESS - The details you input ARE THE SHIPPING DETAILS for Parcels and will be seen on labels, email update communications and other areas such as your special 'MyPage' admins. The email address you input is the address for electronic communication such as your special 'MyPage' admin, access to setup services and status reports. BILLING ADDRESS - We do not offer two inputs for billing vs shipping addresses. The Shipping Address and Billing Address ARE THE SAME. The address you fill out for each order IS THE SHIPPING ADDRESS. IF YOU WISH a parcel to be shipped to a different address other than noted on the SHIPPING ADDRESS at time of order ... and keep records as your billing address... We do not offer that service. The solution is YOU forward the parcel once it arrives at your address onto your third party at your expense via your shipping company. We do not accept any third party movements ever. WHOLESALE - You are buying Wholesale and we consider you as the prime purchaser. Any details you input are used for the 'no-login' shipping system, order matching, labels, via email update communications and access to special 'MyPage' admin features, marketing and other areas/purposes. DO NOT INPUT THIRD PARTY DETAILS as they may be seen by that party. For secrecy, always input ONLY YOUR DETAILS. SHIPPING ALTERATIONS If you require to alter your shipping address AFTER the order has been processed, you must contact us. An additional Redirection Fee by SignsBannersOnline will be applied & charged to you to commence alteration. This SignsBannersOnline Redirection Fee must be paid BEFORE any action by SignsBannersOnline will commence. Also, An additional shipping company Fee will be charged to you for 2nd service delivery. Also, you may be charged additional Re direction fees, re-service fees or any other administration cost as instructed by the shipping company in order to change your consignment label address to a new destination. Also, you may be charge a 'RE DELIVERY' fee by the shipping company should a parcel has previously been attempted to be delivered by them to you. Please ensure your delivery address is correct during the ordering stages of SignsBannersOnline. All shipping is considered 'ground shipping'. ETA Estimated Time of Arrival. Location dependent 1 to 16 days. You can track your parcel at any time. ETA & Destination Hubs. Wholesale orders are manufactured and packed when ready for two (2) deliveries every day, this means that your ETA is influenced by your locality to the nearest Destination HUB. A Destination Hub is the nearest shipping company forwarding point closest to your locality. It may be the nearest Airport, Regional City, Consignment Pick Up Zone or Freight Forwarding Location for your locality. Please allow sufficient time for your parcel to transit through to your destination considering all points that may influence delivery. We are not a shipping company and all orders are 'self tracked' by you. AIR OR GROUND Depending on your location and price to deliver, you may receive an Air parcel or Standard Ground parcel or a combination of Air/Ground. We ship internationally everyday and this may take between 1-16 days depending on your locality. You can track your parcel at any time. OUT OF AREA addresses may require pick up from destination hub or regional agency depot by you. SHIPPING ESTIMATOR On the calculator and 'cart pages before completing checkout the website may show if applicable an ESTIMATED value required for shipping. The 'estimated' value is not set and may be adjusted at any time before, during or after the order is completed. If at any time, additional costs are incurred by us for shipping, insurance, administration or any other, such costs and a administration fee are payable by the customer. The Shipping Estimator attempts to value shipping to your region and may require formal quoting for your zip/postcode, property or building etc. The Shipping estimator is via standard courier to nearest point of delivery for your location and does not include any additional instructions, fees or logistic requirements that may suit your final delivery destination(s). All shipping estimates are for one (1) standard location. Parcels may be bulk packed or individual at SignsBannersOnline discretion and charged by either weight or cubic measurement whichever is the greater. At any stage if we are charged or incur extra costs above allowed for shipping these costs plus any administration fees are payable by the customer. The value set by any shipping estimate is not accepted as final. If you have multiple points of delivery (eg. Split orders) please proceed through the cart pages as 'No pay online' and our team members will formally quote multiple shipping destinations. Flat fee and weight based formulas are used for shipping and these may change from time to time. If at any time you require a formal transport company quotation including handling charges etc; please contact our team using our contact page. The Shipping Estimator determines the shipping estimate based off product pricing and promoted location. This is an estimate, not conclusion and variations may be applied. The shipping estimate does not allow for line-haul delays, custom or bond store delays or any delay of any kind. It is an estimate of smooth process only and used as a guide only. Delivery Region You can order anywhere and ship your order anywhere globally. Your 'home' region is the currency selected COMBINDED WITH your country of delivery, shipping outside your region may influence shipping availability, shipping time and FSA if applies and if INTERNATIONAL SHIPPING EXCESS is applied. International Shipping Excess may add cost to your order wherein additional payment may be required to ship from this site to a foreign address. You can use the Contact Us page for sites nearer your destination/currency. REGION OR AREA NOT SERVICED If your region or area is not serviced, continue with order allocating a nearby location for pickup or extended arrangement by you. Pre-order we will show at the shipping label page if we detect a region not serviced. PACKAGE SIZES In general, items are 'packed together' to lower shipping costs. When two or more items are ordered, the package size may vary depending on logistics, destination, fragility and/or cubic measurements and other. The Shipping Estimator can not determine when multiple products are or are not packed together and you should not rely upon any order being 'packed together'. Package sizes are determined by allowing a reasonable protective value around the item. Eg. Cartons may include 5mm extra packaging size around the sign to protect edges etc. Boxes may be standard flute whilst express bags may also be used. For package sizes, please refer to the size guide on each product detail page. IF you intend to 'bulk pack' different orders together this is not possible. ONLY one order per order is packed. This means clientX is not packed with ClientY. POSTAL SERVICES Local and international postal services may be used. PLEASE READ CAREFULLY Limited Warranties of individual CUSTOM products offered for sale and may vary depending on the nature of the product, typical usage and capabilities. Custom and speciality products are not returnable. IF you return any product, We do not accept pay on arrival costs nor accept products to the warehouse unannounced. Returns must be shipped back to our warehouse at clients expense and clearly labelled with prior telephone arrangement and scheduling. If a warranty or return is due to a shipping reason, an insurance claim must be raised by the customer with the shipper. SignsBannersOnline is not a shipping company. We are Wholesale Printing & Sewing. These T&C's clearly explain that onus is upon customer for all shipping details, tracking and delivery by any third party. We do not hold responsibility for delivery in any circumstance. 1. All products we make are custom, and as such may not be reused, resold, returned or refunded by SignsBannersOnline unless: Wherein written National Consumer Protection Authorities require return of product for further dispute resolution. We do not accept any 'receiver pays' or 'pay on delivery' or 'return to sender' or 'return paid' or similar return cost(s) delivery methods should a product be returned. Return shipping payment is the customer onus. We do not offer any return shipping. We do not provide return transport or shipping or courier or other method of returning a product. You may not return product via our #account - it will be rejected and stock destroyed and you will be liable to shipping company for costs. We do not organize returns. You must organize your own return of product. We do not provide packaging material for return of product. With our large international shipping movements everyday SignsBannersOnline company accounts are negotiated with 3rd party shipping suppliers as 'never return' which lowers your initial costs to deliver your orders to you door to door. There is no return service offered by SignsBannersOnline for any circumstance. We are not a shipping company. 2. We do not allow claims/returns/refunds in circumstances like or similar to: Incorrect orders by customer, incorrect size color layout orientation addresses upload acceptance alterations miscommunication spelling typo's or any other or other instructions by customer or third party. Our on-line system gives customers controlled direct ordering system access with check-lists and approval stages by each customer for each order and this instructs us to manufacture your custom banner sign products via the information you provide digitally and textually. Once an order is accepted by the customer and 'digitally signed' it is instantly processed it can not be changed. Our system is automated. Refunds are not available as cash. Refunds are less banking or other institution fees. Refunds are electronic transfers only in Display Rate Currency as promoted. PROCESSING, WEAR AND TEAR, WEATHER AND OTHER DAMAGING FACTORS We cannot warranty or guarantee rips tears or eyelets pulls, hem, or any conditions that banners are located, any weather condition or outside element that may affect the banners, pillowing or stressing. Each product is manufactured for general conditions and you may choose to install at your discretion. Banners and signs are subject to foreign conditions that may tear the material, pull out eyelets or disintegrate the product. A banner is not a permanent product and not a structure. Products offered are considered temporary and as such should be fitted or dismantled to suit reasonable conditions. Do not allow any product to billow, stretch or suffer any stress. If eyelet(s) are pulled out from the product you should dismantle the product and repair. Normal manufacturing occurs using ink printing systems that may leave residue, roller marks, blemishes or spots that are not reason for warranty and are part of normal manufacturing printing processes and can not be avoided and may be visible within 30 paces. Inks will fade. Materials will degenerate. Fabrics may show pulls or tucks, weft lines or thread grabs. Printing may show banded color or color differences that are a normal part of print manufacturing processes. Ink droplets, minor scratches, machine oil, dust, machine marks, material blemish, print banding, material stepping or roll tensioning OR any other are normal occurences of manufacturing procedures and may be visible at close viewing. Quality Control acceptance is such seen at a viewing distance of 20 feet at vertical placement on wall in daylight conditions. Handling of wet substrates may also cause after production blemishes within normal ranges of supplying your products to you. LIFE OF PRODUCT Products are manufactured for mid to long term for the material. Durability, In general, products are used as short term promotional advertising mediums however we endeavour to make your products suited to a generalized 6-12 months with a maximum life of 18 months in excellent conditions with a maximum UV Resistance ASTM D-4355 %@500 hrs result score 80. National consumer laws intend flags and banners reach a maximum life of 6 months, however, conditions such as weather, useage affect this rating. Your LIFE OF PRODUCT is not warranted under any circumstance. Flags do not have a warranty. The U.S. Government generally expects a flag to last approximately 90 days based on daily usage from sunrise to sunset - but not during periods of inclement weather. Tests have shown that in some cases a flag flown 24 hours a day will last only one-fourth as long as one flown during daylight hours only. The information provided is generally based on information supplied by material manufacturers to us and any recommendations concerning usage or applications of our printing are also believed to be reliable; however, as Signs Banners Online has no control over design execution, and field conditions of the project which incorporate the product Signs Banners Online disclaims all warranties, expressed or implied, including, without limitation, the warranties of merchantability and/or fitness for a particlar purpose. Finished Order Size: All care is take to provide you with your order size HOWEVER some materials move, expand, shrink or return to roll tension lengths during the manufacturing and processing. Please allow +/- 2-10% variance in finished order dimensions. Life of product. All polyfabrics and Vinyls shrink from original processing, manufacturing and application size. Variance of Product. Products may vary from details or descriptions provided and may be influenced by purchasing availability, factory capability, expired offers, redundant info, unavailable componentry, materials or other. Products displayed may not be current and we recommend you 'test order' or contact factory support pre-setting any major orders or account fulfilment. SIZE & WEIGHT ACCURACY Sitewide, all displayed and implied measurement dimensions ARE conversion sizes averaged for simplicity. Example a 14.6mm component may be averaged and displayed as ½" or 10-15mm. Inches or Millimetres may be displayed as nearest whole or part value. Weights: Weight is estimated value via cubic or measured packaged or guessed final package pre manufactuing and packing. Weights displayed are a guide only. If available, Check technical or enginerring drawings pre-order. All web images, web descriptions and web data listings are simplified representations. DIMENSIONS Manufacturing Dimensions are calculated and rounded to the nearest suitable tolerance 2 Inch ±10% height x 2 Inch ± 2''/yard length for manufacturing wound rolls and are not accurate. Manufacturing flexible and wound material that may increase/decrease substrate size is normal process of manufacturing and may vary. Individual component tolerances are not displayed. Cut sheets may need machine grip or tolerances per setup. Dimensions may FLIP - this means convert from imperial units to metric units automatically or via customer input and may be rounded to nearest suitable tolerance. Machine and Labour tolerances may also apply. Finished order size dimensions are not guaranteed nor promised. INSURANCES AND CLAIMS Products may or may not be insured using normal 'delivery company' third party policies and we can not warrant any insurance policy by such delivery or courier company or third party or other. Claims require / must accompany photographic evidence or administration of product at the clients expense. Insurance approval or denial is the sole responsibility of any said third party and we do to accept any liability for such issues that may or may not arise. Whilst we are a manufacturing company, all insurance claims are processed by third parties. We can not replace any item free of cost whilst an insurance claim is in process and any value assessed is the responsibility of the insurer. If you would like to undertake your own insurance policy we only accept 'full client pick up' arrangements from our warehouse(s). Note: Typically, delivery companies will not accept return shipping costs at their cost or loss. If a product is damaged during shipping, an insurance claim is created by the receiver, inspected and assessed by such delivery company representative, insurance company representative etc. We do not provide any assistance in third party policies or procedures. Clients pay all and any shipping costs. Special offers, if a product is promoted with or advertised with insurance included the offer shall not exceed a level of price as the wholesale value as determined for manufacturing of such product wherein the all or part of the product is assessed for any such claim. Insurance is based on manufacturing value not retail values. SignsBannersOnline DOES NOT DEMAND INSURED SHIPPING. SignsBannersOnline do not demand or solicit further payments for insurance. GUARANTEES CONSUMER RIGHTS SBO offer guarantees and consumer rights as normally represented as wholesale buying agreements outline. As we supply over 150 countries, your regional, county/state/territory or national consumer laws may offer differing applicable statutes. Purchasing any service or product is considered to be CUSTOM WHOLESALE for which we will deliver a quality product for the price valued. WHO TO CONTACT We have a full team of in-house qualified graphic artists, sign makers, designers etc..,... And... as such, do not have a sales team. Rather, you can contact any one of our art department or factory support teams for direct advice, prices, procedures and requirements to order your products. At anytime, we encourage to talk directly with our creative team, those who make your signage or are responsible for packing and delivery. Our transparent nature and dedicated quality approach ensures your signage is made perfectly and we give every product a 100% quality check before various stages of completion. COMPANY INFORMATION: SignsBannersOnline is a website trading name, trademark and registered brand list of Afilm Pty Ltd which is an Australian company manufacturing signage GLOBALLY in different countries and regions and advertising products direct for end users, advertising agencies, event managers, small and large business etc. Head offices are located in Australia and finished goods are globally shipped twice daily door to door from the nearest manufacturing destination near you or product specific manufacturing location best suited to your orders and volume. Payments are held in an Afilm account for up-to ten (10) days before being released to the factory. ADVERTISED PRICES Prices and specifications may change from time to time, depend on stock availability, advertised promotions, seasonal factors and promotion department management. In general, we may hold 'formal quoted' prices for 30 days and website promoted prices for that day or stock level promoted. To maintain a price, please ask anyone of our team to generate a formal quotation and send to you ensuring we maintain the quote. Should a price decrease within a certain period, please contact us for your adjusted price, depending upon the nature of works or availability of product at that time. Advertised Prices found on the site are subject to change at ANY time. Add Tax to prices found on the website. Official estimates are created for a job after an initial quoting process. Official estimates are valid for 30 days only. Jobs with official estimates due outside of the 30 days MAY have to re-quoted according to current advertised prices, availability of materials and other influences. DISCOUNTS AND QUANTITY PRICING are determined as short term offers and may increase or decrease from time to time, expire or be removed. To maintain a fixed price please ask for a formal quote to be raised and sent to you showing a price or promotion is held for you. Advertised prices are informal and subject to change. To confirm pricing, all jobs require a 'formal quote' prior to production/packing. To obtain a formal quote, you may order online or contact factory support team. Once job specifications have been outlined & delivery details understood, a formal quote is generated & valid for 30 days. A formal quote is NOT the same as an online quote. The formal quote pricing may differ from the advertised price. Factoy support team members are more than happy to go through your quote & explain your individual job requirements accordingly. Quantity discounts may apply to some products and not others. Multiple printed graphics must come from a single file to receive quantity discounts. DEPOSITS In general, deposits are not required to order a product or begin a project. In particular circumstances, a holding or custom volume order may require a deposit. We are proud of our great reputation of making quality products and have systems in place that give you accurate deadlines, top quality products, low costs and easy business channels to work together. If you would like a promotional price to be held longer than advertised, we may do so provided a non returnable 50% deposit is received before such promotion expires. WHOLESALE OR RETAIL PRICING As we endeavour to reduce pricing for all our clients, we introduce quantity discounts that give fair pricing to all. If you are a business owner looking to save please use the quantity discounts available to lower your costs further. Any further Wholesale pricing for a client may be available after 3 normal orders. Large bulk orders of the SAME PRODUCT (with the same design) may have quantity discounts available. Please enquire with our team regarding large quantity orders. TAXES All prices are shown calculating YOUR LOCAL WHOLSALE TAXATION RATE VALUE and goods are determined as 'Offered for resale' by the purchaser under the classification of 'Statement of Wholesale Supply' We supply many goods and services to thousands of businesses with various tax rebates, incentives etc and show all prices WITH OR WITHOUT TAX unless otherwise stated. For our international clients, Goods and Services Tax (GST/VAT/DUTY or by other name) is 10% of wholesale/retail invoice price and is applied to shipping, any customs duties and other incoterms. If you are purchasing wholesale/bulk items from us, you may claim back the TAX components as per your local state/territory taxation rulings. We provide you with a 'Statement of Wholesale Supply' with every order. You maybe required to pay a tax to us and then claim such tax return via your Taxation Office Statements. All products sold include a TAX INVOICE attached to packaging or PRINTABLE RECEIPT via electronic delivery to administration department. A 'class ruling' tax and any other applicable tax in your region/country/state may apply. Any other tax for your country/region also applies when ordering any taxable product or service. When an order has been placed, an Invoice in your SELECTED CURRENCY will be supplied for payment or accompany your goods when ordered and paid on-line. IMPORTANT SignsBannersOnline offers custom goods Wholesale and available for RESALE BY YOU. This means you are responsible for any/all taxation requirements for your local state/territory. We have applied the base taxation for OUR efforts only. Further taxation/ruling/applicable situations for your business are not the responsibility of SignsBannersOnline or any of our incorporated affiliates. All Orders/Supplies/Product are offered Wholesale as available for RESALE by you. TAX POSITION SBO offer goods under the Incoterm Free Carrier 'FCA' and bulk all orders (all customers) into a major ground shipping account known as 'free shipping'. All orders you undertake include a statement of wholesale supply for which if required present to your applicable taxation agent for tax duties payable, claimable or non-action, fees or refunds. As a wholesaler/reseller, you may be required to adhere to further obligations in your state/territory/country. Any information provided by SBO is a guide only and should not be taken into account. SBO do not offer further taxation information. PAYMENT OPTIONS Orders are paid for before being despatched. Secure on-line ordering allows you to pay using PayPal. Payments are held in an Afilm account for up-to ten (10) days before being released to the factory. Currency Conversions Transacting in Multiple Currencies. PayPal has launched Multiple Currencies to facilitate payments among our diverse base of international members. PayPal is pleased to offer conversion rates that are competitive with those of other consumer services. The most readily available information on currency exchange rates is based on "interbank exchange rates". Interbank exchange rates are established in the course of currency trading among a global network of over 1,000 banks, and are not available through consumer or retail channels. Consumers may use these rates as a reference, but should not expect to use interbank rates in transactions that involve currency conversion. To obtain actual retail rates, contact your local financial institution or currency exchange, or check the rate displayed in your PayPal transaction. In addition, you can go to 'History' to review the currency conversion calculations from previous transactions. There is no currency conversion for transactions where you: Send a payment using a funding source in the same currency. Receive a payment in a currency for which you hold a balance (you do not need to have funds in the currency balance). Withdraw funds in a local currency from your PayPal account to your local bank account. For further information or policy changes see PayPal website. PAYMENT PROCESS- (FINALIZE) Payments are held in a neutral fund until you release them. You can order now and finalize payment later. Ten day buyer protection (included free) Your payment is held in protection for up-to 10 days before being released from a neutral bank account. Funds are held in a bank account until the client has approved the completed work and authorized us to pay the factory via a Finalized instruction or automatic ten (10) day period release. All PayPal buyer protection policies still apply. No data or details are stored or transmitted on SignsBannersOnline.com Payment gateways are encrypted by PayPal security features. You can use all features of PayPal account and/or card services such as Visa / MasterCard plus+ more.You can pay in your preferred currency. IMPORTANT Completing your PayPal transaction. After completing your name details, uploading, viewing your Instant Preview and payment via the PayPal gateway you will be automatically redirected back to a special 'MyPage' on SignsBannersOnline.com to Finalize the order. After ten (10) days if you have not Finalized your order it will be automatically Finalized and payment released to the factory. CREDIT We do not hold any credit accounts. We may create artwork, purchase materials on your behalf, manufacture goods etc. before payment. Any payment is due before goods are delivered. Certain projects may require a deposit before works commence. All formally quoted jobs require approval via signature prior to production. Jobs are then manufactured & or packed prior to any payment. Full payment is due prior to delivery. Pack & send items may be sent immediately once payment is received and confirmed. COUNTERFEIT or MISLEADING Copy or Similar SignsBannersOnline will not manufacture illegal works for any destination at SignsBannersOnline sole discretion. MANUFACTURING From our base manufacturing or satellite warehouse locations wholesale printed and sewn supplies for resale are shipped to clients internationally on a daily basis. Capabilities include custom banner signage, display expo stand printing, mesh, wide format digital polyfabric printing, sewing and an in-house art department and contract design department capable of creating artwork in both digital and traditional forms. Signage is produced using a myriad of techniques, processes and finishes. Any additional costs required during the manufacturing process may be charged to the client. Prices quoted may vary depending on actual manufacturing processes required. The on-line calculators are estimate only and may not reflect actual price. Products/Goods/Supplies may be manufactured in non central locations as determined by SignsBannersOnline at its sole discretion. Turnaround times and manufacturing time-lines are given as a GUIDE ONLY. Please note that manufacturing times vary depending on product. Please enquire with your SignsBannersOnline team member to find out about turnaround time specific to your order. Turnaround times are determined from when we receive approval for pricing and artwork and process the estimate into an order. E.g. Turnaround time of 4 days FROM when we receive pricing and artwork approval, NOT from point of initial pricing/quoting. Speciality orders may require more time. Allow 10 days for expertise craftsmanship. We understand deadlines and lead the way for fast production. If you require more urgent time lines, please ask your SignsBannersOnline team member to assist pre order. Fees or costs may be incurred. Our recommended production time is four days from approval of artwork. This is how long before your project may be dry or complete from our central manufacturing location. Some custom made projects may have a longer production time and this extended time requirement may be advised by a SignsBannersOnline team member. We use the most reliable Courier services to deliver your project. Whilst we cannot guarantee exact delivery times, we follow and suggest the recommended time of delivery arrangements as provided to us by the chosen courier or transporting company. Unless prepaid urgent/guaranteed deliveries are arranged, normal shipping applies. Small size orders. We reserve the right to hold small orders until appropriately nested with other small orders so as not to generate roll waste, non-profitability or loss. PRODUCTION SCHEDULING 1-5 DAYS Our large volume banner printing and finishing capabilities mean fast 3-5 day production scheduling of signs and banners delivered worldwide. This may occasionally change and customers may be notified through the TRACKING PROGRESS links forwarded with every order. You should not rely upon our production scheduling for deadlines. If you have a deadline you must pre-communicate with our team in advance for scheduling clarification. We reserve the right to alter, change or delay any production scheduling. ACCESSING SPECIAL OFFERS - Let Us Design Department. To be eligble for any promotion offered by the Let Us Design Department, it MUST BE STARTED via the Let Us Design 'START HERE' page. Sufficient information, details and instructions to the Let Us Design Department must be completed online by the client to begin the communication process. Other approach methods are not accepted as eligibility for special Let Us Design offers and fees will be added. Setup is not design. Setup means placing your creative onto a manufacturing template and uploading to the factory print queue for manufacturing. All artwork services are time limited and additional time blocks must be purchased for any design alterations, changes, modifications or periods longer than purchased. This business models requires pay for service. See prices here. IMPORTANT: Graphic design quotes can vary & calculated based on individual requirements & design briefs. Changes & modifications may be made however additional charges do apply. ARTWORK - FREE ARTWORK SETUP [ IF available during period at time of order] Free Artwork Setup is capped to a maximum value of 15 minutes. Multiple line items or orders may require additional setup fees. Free set up means composing existing elements and logos that you attach and send to SBO via Let Us Design, adding exisiting font texts and changing vector based backgrounds. Free Artwork Setup does not mean new creative processing, idea implementation, sourcing of imagery or other 'new' based design. Free Artwork Setup means SBO will upload to 'Instant Preview' status ready for client approval of banner print ready files they can approve, pay and printing with SBO begins. Scheduling - Free Artwork Setup operates on a 5 day cycle time. Free Artwork Setup does not mean providing free services for other printing. ALL RIGHTS RESERVED. Free Artwork Setup does require client agreeing to purchase of product with Signs Banners Online. Fail to order recinds Free Artwork Setup and client will be invoiced for artwork setup and costs. ARTWORK - $1.00 [ If available during period at time of order] Base artwork is replaced by $1.00 limited fee ADDED ONCE ONLY TO a SINGLE ORDER for ONE TIME ONLY. Artwork-$1 is not displayed individually via the calculator. This incorporated promotional element is non-refundable or subtracted if a client self uploads or completes any ordering action. This promotional element may be incorporated into the calculator ammortized pricing structure and is not refundable. If set-up, creative, composition or any other payment for services OVER the promoted amount is required then that/those separate fee(s) are listed as special charges and/or line items and payment is due accordingly. Base charges may alter from time to time. Contact factory support for current and/or overtime or seasonal rates or other for any further paid services. Design time offered Artwork-$1 is set to fifteen minutes time value file set up for print onto a manufacturing template. Alterations incur additional fees. $1 can not be purchased multiple times. $1 not available on economy shop products. ARTWORK - AUTOCALC Our 'autocalc' artwork PRODUCT is available at the cart page and is SETUP ONLY. Autocalc is not a 'creative' service. After selecting any artwork service we offer This is an automated semi-inspection of your upload and allows our graphic designers to manually inspect your file for a period of fifteen minutes. Autocalc is a first step service only and does not allow for modifications or alterations, reupload or changes. Autocalc is a limited time service capped to fifteen minutes. Alterations and modifications incur additional fees. 2. Before Production and/or Printing is made. ARTWORK is generally completed within 1-4 days from receiving instructions/files to compose for you and all print orders include an on-line digital artwork proof before production begins ensuring accuracy, output and speed of manufacture for your orders. Artwork may run overtime and shall be charged at nominal rates. Artwork may be supplied in full, ready to print following our guidelines and specifications. Alterations, adjustments or suitability for production to our standards and specifications may incur additional cost. Our designers can also do the layout/design for you, but this may incur an Artwork charge. Artwork charges may vary depending on complexity of the job, and you may be made aware of the cost before proceeding or depending on scheduling, communication etc., artwork changes may be made on your behalf and charged at nominal rates. Please Speak with your SignsBannersOnline team member to find out more before creating incorrect art that is difficult to produce with machinery, printing etc. Typically, prices include an online instant preview which is a system of acceptance by the client requiring approval (digital code) signature before any production begins. Instant previews must be approved prior to any production and accepted by our production team. In-house designers can supply complete designs within 1-4 days. Graphic design quotes can vary & calculated based on individual requirements & design briefs. Changes & modifications may be made, however additional charges may apply. Please ensure all aspects of the artwork proof is checked & double checked. Once the proof is signed, all aspects of artwork will be printed. SignsBannersOnline accepts no responsibility for incorrect artwork, oversights or any other. It is the client responsibility to check all aspects of the proof before signing acceptance. Purchasing artwork on-line choose from the levels available. Small artwork charge, Moderate artwork charge or Complex artwork charge. These services are based on complexity and not time value. Alterations or adjustments to any artwork may require additional costs. ARTWORK ORDERING TIP: If you are unsure the level of artwork required, please use our Let Us Design service. Font Replace/Substitution We do not manually 'search for' or 'replace fonts' if they do not exist on our systems. PSD, AI, CDR etc may attempt to replace fonts if fonts in your files are missing, however WE DO NOT ACCEPT responsibility for any font replace/substitution. When font substitution is being used to find a replacement for an unavailable character, it can lead to inconsistent visual appearance as part of a word or sentence is displayed in one font and another part is displayed in the substituted font. A method to work around this problem is to display the entire word or paragraph in the substituted font. Nevertheless, font substitution may be critical to scripts not well supported by a large font inventory having the required Unicode range. You should rasterize all elements of your print files and submitted flattened design files only. ABOUT TEMPLATES Templates open in graphics software programs such as Photoshop. You'll need graphic software or hire a designer. IMPORTANT NOTE: Set-Up is not Artwork. We include an Instant Preview also known as a an 'on-line signature proof' with all signage to set-up (uploaded) your design ready for manufacturing and machines unless otherwise specified. This does not include 'creative' or 'artwork alteration', 'redesign' or 'color changes, fonts' etc. Set-up is used only to load machinery with your signed approval ready for manufacturing. Imagery and shown Graphic guides are for illustration only. Measure actual sizes, colors, features, options and other best suited to your purpose. COLORS AND VARIATIONS: We do not guarantee colors or variations, processes or techniques, project matches colors, batches, previous output etc. CMYK color output and or variations or any other are not accepted as returnable. Processes and influences may affect color reproduction and as such no project undertaken is returnable for any color perceived or produced that may or may not match expectations, previously made or supplied. RGB color conversion, paint or coatings, substrates or batches etc are not within reason for not accepting work produced for payment. Whilst we take all care to produce quality work, color output is not accepted as a returnable or non payment claim. Special instructions are not part of any warranty and are reliant on customers providing accurate artwork files with correct visual marks crops for finishing. We do not manufacture speciality color or spot color items. INK INKS BWS 3 TYPICALLY, our inks are rated to a Blue Wool Scale of 3. This is a fantastic international standard against sunlight fade BUT does not apply to regions wherein outside factors may apply. We use quality inks designed to give you the longest 'anti fade' lifetime however your situation and location may introduce factors that may or may not affect the rating outcome. It is one of the highest ratings we can achieve. PRODUCT INSERT Available at the Cart and Calculator the LINE ITEM is assigned a alpha character (A B C D ... Z). This is generally the product line item insertion into the printing queue. IF you wish to alter, please move your LINE ITEMs up or down via the Calculator. Eg: Remove Line Item A, B, C. The way your line items appear in the cart are how they are manufactured. Disretion is applied by factory production team. DESIGN COMPETITIONS: SBO do hold design competitions via the SBO website (and third party industry websites) and retain introductory submissions from graphic designers, advertising agencies, contractors and staff and others by outlining a 'creative brief' for their submission. Recieved entries (art) may be displayed on the SBO website. IF a client refers to a submission displayed on the site, or photo of manufactured work, we endeavor to put the client in-touch with the original artist for 'paid work' as a contractor or individual entity. Competition entries relenquish copyright IN THAT we are freely able to show on website and marketing material the work without demand for payment or removal. Originating copyright remains with the original artist provided that the original work is original without recourse. ZIP TIES Free or Bonus Zip Ties may be included from time to time. 4.8*200 Nylon Break Weight 8kg. Online forms do include information stored by Signs Banners Online that we (SBO) use for the 'no-login' shipping system, order matching, communication, marketing and other purposes. Email forms are encrypted however you should also ensure your devices are properly protected. If information of a general nature is shared it is 'under consideration of your privacy and security and used for the purposes of system improvement, technical advice, development, and offers that may be best related to you as an SBO user'. Information or data is not sold, leased or lent to third parties. Privacy: Images. Reseller orders and known 'trade accounts' imagery are not shown on galleries or marketing materials. The images you see via the gallery pages etc are post-let us design or general customer use only and used for demonstrative purposes only. No reseller images are intentionally listed. Privacy: Customer Satisfaction, wherein a customer provides advice of their satisfaction those comments may be represented as a star rating or paraphrased or edited to present as marketing material and may or may not edit real names in the interests of privacy. Customer comments on the SBO website are originating truths displayed with edits to protect privacy via names or locations. Star Ratings: Stars are chosen by customers and presented for differing or grouped campaigns. Results are generally tallied and averaged however on some occassions shown to best represent single entities or results. Privacy: Live Chat, No login is required to chat, however, you have an option to save the chat. Saved chats are stored for short periods only. Data is periodically deleted. Your support person also has an option to save the chat that also is deleted periodically. Live chat is used as a 'note pad' tool only. It is not linked with any order storage or order input details. Privacy: Sample Books and Contact Us, we do keep records of sample book requests and contact us records that may be used for marketing, shipping, system improvement or other. The policies apply to all orders and products manufactured and the client agrees to the above as standard policies of condition of sale. Manufactured technical fabrics for general print signage using solvent, eco solvent, dye or alcohol inking systems. ADFL01 is manufactured to meet NFPA-701 Small Scale. DBAB is manufactured to meet NFPA-701 Small Scale. DBFM is manufactured to meet NFPA-701 Small Scale. DBSM is manufactured to meet NFPA-701 Small Scale. DCPU is manufactured to meet NFPA-701 Small Scale. DSDS is manufactured to meet NFPA-701 Small Scale. GLBA is manufactured to meet NFPA-701 Small Scale. GLXY28 is manufactured to meet NFPA-701 Small Scale. VELO is manufactured to meet NFPA-701 Small Scale. - To assist our wholesale customers with any dutiable RESELLER taxes, we now include a 'Statement of Wholesale Supply' with one package on your consignment ALONG WITH your Invoice Copies and Shipping Documents. Read more below. - The Statement of Wholesale supply helps the customer clarify with their state/territory dutiable tax rulings or industry class tax rulings in their country of the goods supplied and the manner in which resale of goods occurs and reporting the sale of the goods IF they resell. Commonly known as Claim Back. Your Statement of Wholesale Supply may or may not be used by you to claim back RESELLER Taxation/Duties that may apply in your state/territory relevant to your conduct of normal business practice and Taxation Classes/Rulings in your state/territory. SignsBannersOnline offer NO taxation advice. 1. Except as otherwise noted the property described will be resold in the form of tangible property and that the manner any property is used for a purpose other than retention demonstration or display whilst being held for resale is tax dutiable by the resale receiver for which are not paid by the wholesale supplier being mentioned above. If the reseller is not required to hold a permit or registered to resale because the reseller is exempt or does not make sales in the state/territory applicable for such this is applied in the regular course of business and reporting the sale and paying dutiable taxes if any that may be required for local statutes and chapters are bound in that state/territory by that purchaser. 1. (...name... ) As a representative of the (company named) I/we confirm we are the originator of cargo we present for carriage, and confirm that the cargo is prepared and handled in a manner which will not compromise its security standing. The consignments do not contain any illegal or prohibited materials or materials in the interest of International Copyright Law.